I had several ideas in mind for my Halloween costume this year. 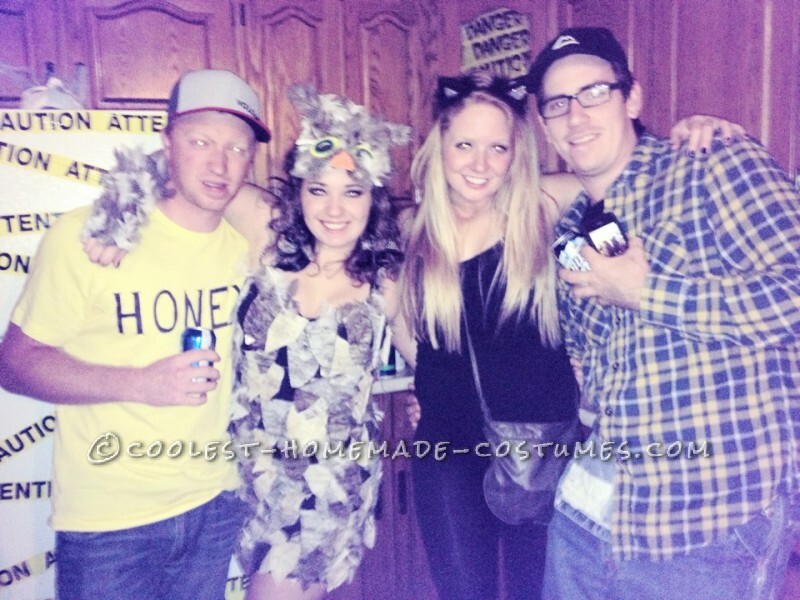 The costume ideas were Pocahontas, Disney Princess, cat and owl. 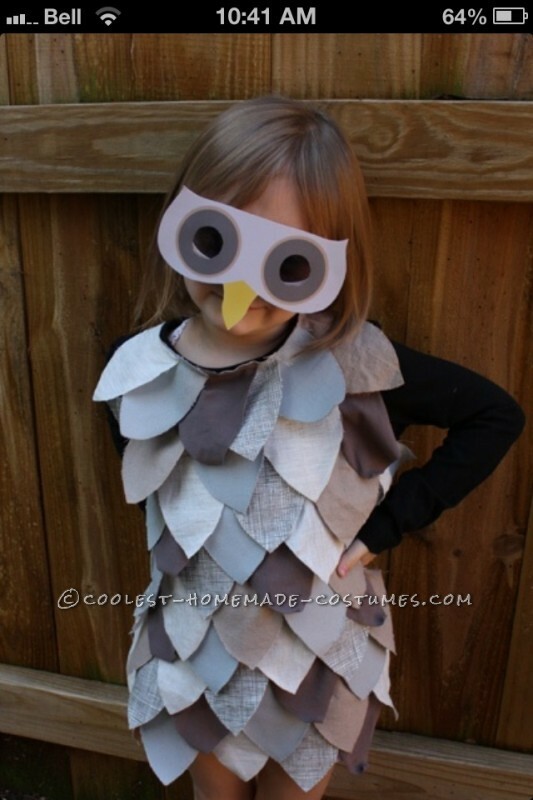 My decision to be the owl was not hard to make after looking through pictures on Pinterest. 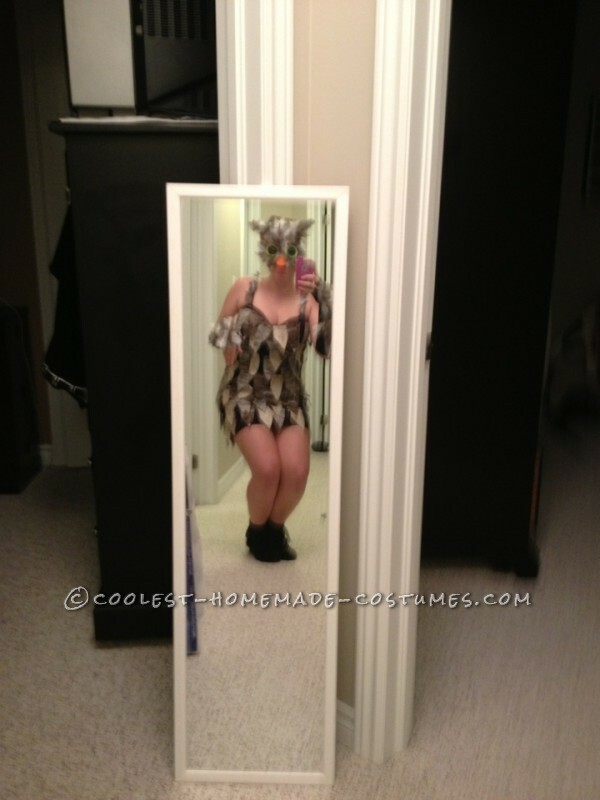 The picture that I saw was one of a young girl who was wearing a handmade owl costume. 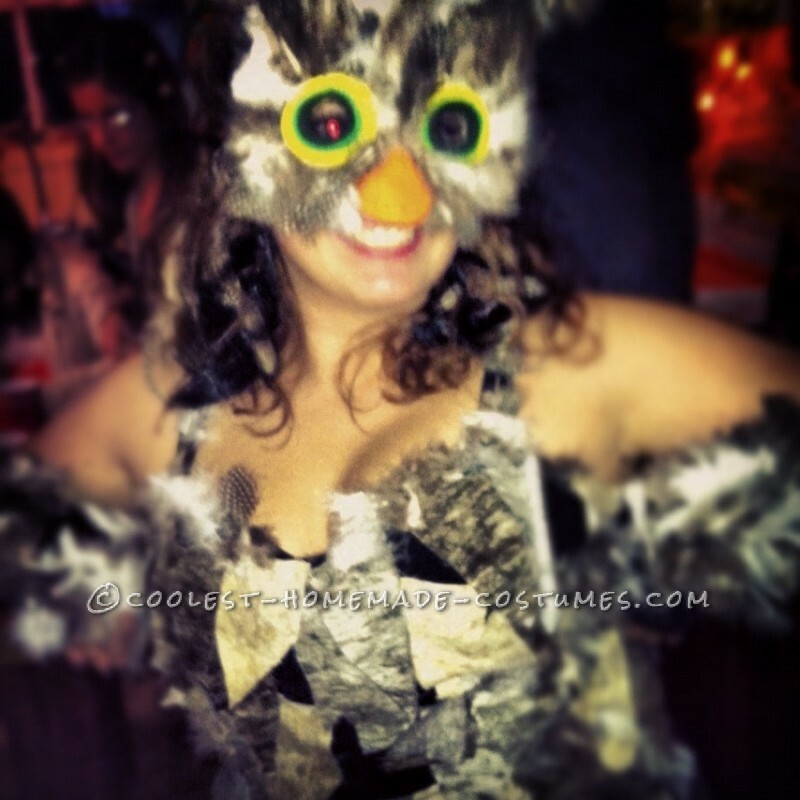 She was wearing a mask and a dress that had different shades of brown fabric cut into a feather shapes. While looking at the picture I already began to think of the ways that I could make this costume. I started working on my costume a week before the date of the Halloween party. The first night I worked on my making my mask. I bought a white plastic mask, feathers and colored foam pieces. I painted the mask brown and once the paint was dry I began to hot glue feathers to the mask. I cut a large triangle piece from the colored foam sheets and glued feathers onto it. This piece was then glued to the forehead area of the mask. This piece helped to make my mask larger and also made it look more like an owl. I then cut foam sheets into circles with holes in the middle because these will be the pieces to go around the eyes. I cut yellow (large size), green (medium size) and black (small size) circles for each eye and hot glued them to the mask. The next day I had an idea for my arms. I decided to cut up black leotards and I cut five holes at each ends of the leotard and cut them off above my elbows. I then began to hot glue feathers on the upper sides of the leotards making wings. Three days later I began to work on my skirt and tank top for my costume. I bought three different kinds of brown and grey material, all cut at 1.5 meters. They were cut into feather pieces that were then hot glued to a black skirt and a black tank top. I didn’t really have a pattern for the colors, I just placed them randomly. I also hot glued real feathers in random places on both tank top and skirt. I glued real feathers on the straps and around the top of my shirt. The day before the party I had an idea for my hair I wanted my hair to be big and wild. I decided to buy a wig from the dollar store and cut the wig into hair pieces and glued them to bobby pins. 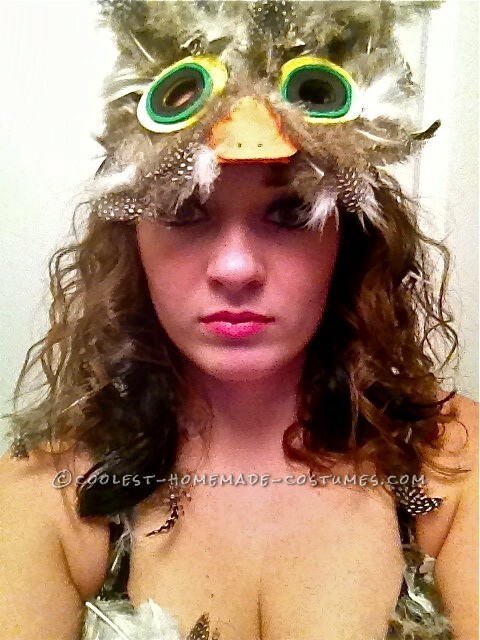 I then glued real feathers to the hair pieces. 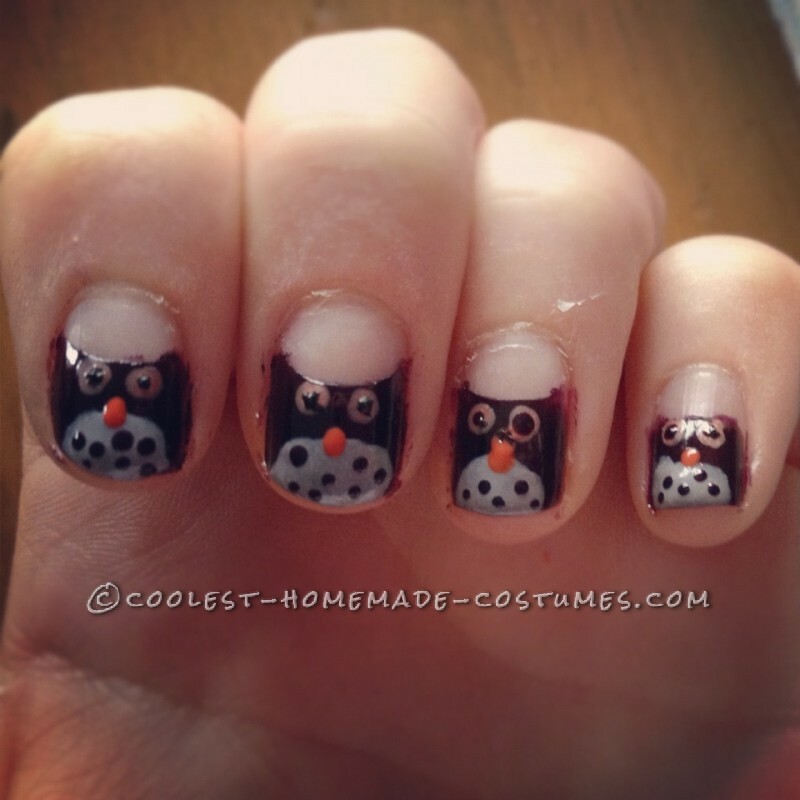 The day of the party I painted my nails into owls. I placed Reinforcement Labels for paper near my cuticles. I painted the rest of my nails a dark purple and removed the Reinforcement Labels when finished with that color. The Reinforcement Labels made the body of the owl. I placed a small amount of grey nail polish in the middle upper area of my nail to make the stomach for the owl. I added dots for eyes, beek and spots on the stomach. The night of the party had finally arrived. I decided to go with a dark smoky eye make-up and bright pink lipstick. I wore my hair half up and half down with my natural curls and the hair pieces that I made. At the party EVERYONE loved my costume. There was prizes for best female and male costume. I won the best female costume! I was so happy that everyone enjoyed my costume that I had put so much time, thought and effort into. After having all the positive reactions to this costume I’m excited to start creating more costumes for the upcoming Halloweens. This whole experience was a lot of fun for me. I recently just graduated from college, so this was a project for me. The reasons why I loved creating this costume was because I was able to get the colors that I wanted and I was able to add MY creative touches and I knew that no one would have this exact costume, where with store bought you’re not guaranteed that. While in the process of making the costume I kept showing pictures to my friends and everyone who saw the pictures all had positive comments. Which I was very happy about!